I have been playing pool for 20 years. I have worked closely with Instructors like Mark Wilson, Nick Varner & David Matlock. I am currently the house pro at Jupiter’s Billiards in Champaign, IL. 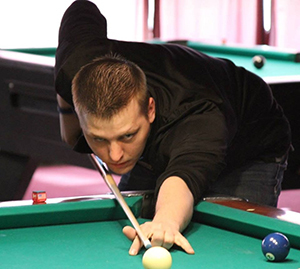 I have competed in countless local and regional tournaments as well as several major events such as the Derby City Classic, Midwest 9-Ball Tour & now the world Tournament of 14.1. I have been giving lessons locally for half a decade. I am also a player representative of the Cue Sport Billiards Academy, Peoria, IL.